There was a time when people relied mainly on their TV to get the news. You can catch up with a lot of things over the Internet these days. 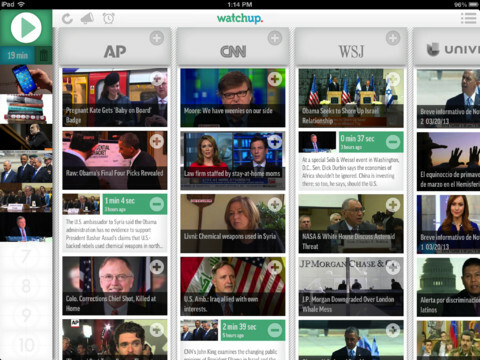 Watchup for iPad is one of many apps you can use to keep up with video news on your tablet. It gets you news snippets from your favorite channel and puts you in control. Just set the time and duration, and you are set. Watchup News has a user-friendly interface. For starters, you can choose how much time you want to dedicate to getting the news and when you want your news to be delivered. The app does not take a whole lot of space on your iPad and allows you to edit your channel line-up. The news plays without interruption, so you can catch up with as much as possible. 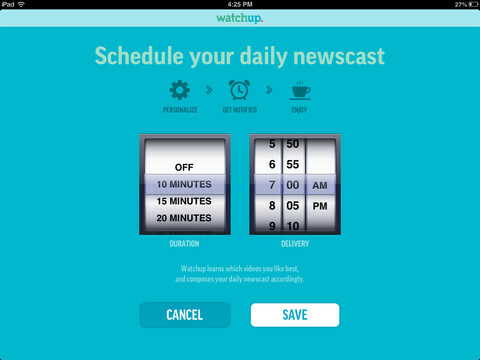 Watchup News is good looking and easy to customize. If you need a tool to help you keep up with the mainstream news sources, this app has you covered.